Peter Faminow fonds: Peter Faminow was born in Alberta to Doukhobor parents. He studied law, and became actively involved in the Doukhobor youth movement. He helped organize the 1958 Conference on Peace through Non-violence, authored a column called “Dasha” in the Doukhobor publication Mir, and served as the secretary-treasurer of the Union of Doukhobors in Canada. After relocating to North Vancouver to practice law, Faminow served as a councillor and alderman for the District of North Vancouver between 1960 and 1974. 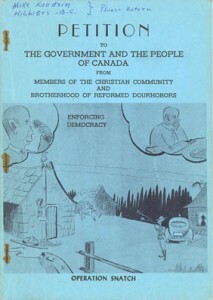 The fonds contains documents related to both Faminow’s career as a lawyer and politician, and also related to his involvement in the Doukhobor community, including rare documents circulated in the Doukhobor community in the 1920’s-1950’s, documents related to the New Denver school issue, and correspondence with Koozma Tarasoff. The finding aid for the fonds can be found here: http://www.library.ubc.ca/spcoll/AZ/PDF/EFG/Faminow_Peter.pdf. The image above is shows the cover of a petition to the government regarding New Denver School (from file 3-17). W. Randle Iredale fonds: A graduate of UBC, Randle Iredale was a well-known Vancouver-based architect. Some of his notable projects include the development project at Portage Mountain, the Sedgewick Undergraduate Library at the University of British Columbia, Vancouver’s Park Site 19 Project, and the Systems Control Center at Simon Fraser University. Randle Iredale passed away in 2000. This fonds contains extensive material related to Iredale’s architectural career, including technical drawings, photographs and slides. The finding aid for the fonds can be found here: http://www.library.ubc.ca/spcoll/AZ/PDF/I/Iredale_Randle.pdf.